Was it a bad omen when you couldn't zip up your wedding dress? Erin Merritt looked over her shoulder at her reflection in the full-length mirror hanging on her bedroom door and sighed. A good two inches of skin peeked out between the zipper teeth, taunting, Neener, neener, neener. How had this happened in just a few weeks? Don't play dumb, scolded her inner mother. You know how this happened. And then her inner mother gave her a little pat on the shoulder. But it's understandable. You've been under a lot of stress. She had. Her job as an event planner was stressful enough. But in addition to being responsible for making all those fund raisers and community festivals in nearby Seattle smashing successes, she'd been working on a shoestring on the most important event of her life, her wedding. If Mom were still alive it wouldn't have been a shoestring. Mom always said, "What's money when you're making memories? Memories are priceless." Especially wedding memories, and that was why Erin wanted a storybook wedding. But Adam Hawthorne, her prince charming, kept trying to mess up the story at every turn. "We're going to have some tight years at first. I don't want to rack up more debt than we have to," he was always saying. If she followed Adam's cheap-o suggestions they sure wouldn't have any debt. They wouldn't have any wedding, either. His mom had offered to spring for the cake, so there had been no need to argue over that. But they'd argued about everything else, from the flowers ("You don't need to budget so much for flowers, babe. My cousin could do them for us - she's big into gardening.") to the location ("Let's get married in your aunt's backyard.") Nice of him to volunteer her aunt, who had already done so much for her. Adam had no problem with volunteering people to do things for them to save them money. Erin, on the other hand, was reluctant to draft free labor. It was both tacky and dangerous. Just because someone liked to arrange flowers or take pictures, that didn't mean the person was any good at it. Okay, she got that he didn't want her to spend fifty thousand dollars on a wedding, but he was carrying this broke med school student thing way too far, especially since he wasn't broke and his grandfather was taking care of he medical school bills. (It paid to be an only child with generous grandparents.) Anyway, it was their wedding, for crying out loud, and she was footing the bill for most of it. Adam's argument to that was that he was going to get her maxed out credit card bills right along with her. So what? She'd be the one paying them off. Anyway, now many times did a girl get married? Only once, Mom used to say, and then a woman got smart. But Erin didn't want to get smart. She wanted to marry Adam. Wait a minute. That hadn't quite sounded right. "We can put the money we save toward down payment on a house," Adam kept saying. "You don't need a big party. Let's be smart about this." Depressed, she slipped out of the gown, returned it to its garment bag and hung it back in her closet. She could just imagine what Adam would say if he found out she'd outgrown the wedding gown he thought she'd spent way to much on. Why had she been so dumb as to come home from work and try the thing on anyway? Oh yeah, to cheer herself up after her crappy day. Well, cheers. "You've got to quit stressing," Adam was always saying. Funny, considering he was one of her biggest stressers. Erin sighed. Okay, everyone had their faults, and Adam's cheapness wasn't really a fault. He just didn't get how this all worked. Weddings cost money. And you had to plan ahead, far ahead. The Heart Lake Lodge was booked a year in advance, sometimes two. And she much preferred to use that idyllic location rather than make her aunt go crazy trying to get her house ready for a wedding. She could afford to pay her way.She didn't have to use people. Adam didn't know it yet, but Erin had already reserved the lodge. Her friend Bev, who worked there, had told her there'd been a cancellation. Thank God for connections. Bev had ignored the waiting list and put their name on the event calendar. And when the time was right, Erin would tell him all about it and explain how lucky they were, and then he'd be as excited about it as she was. It was mid-January now. The wedding was in June. Hopefully, the right time for telling Adam would be soon. Erin suddenly felt a need for . . . something. She found it fifteen minutes later at the Safeway on the chips aisle. There was nothing like chips and salsa to make a girl feel better. Chips, salsa, and a margarita, she decided, and picked up some drink mix, too, to go with the half-full bottle of tequila she had stashed at the back of the cupboard. Dan Rockwell was working the express check stand tonight. He smiled at her, then eyed her grocery items. "Party, huh?" "Not really," she replied. She should have picked a different register. Then she wouldn't have had her brother's old buddy assessing her food purchases. "Dr. McDoodoo must be coming over." "That's McDreamy," she corrected him. "Like in Grey's Anatomy." If he was going to eavesdrop on private conversations people had every time they waited in line he should at least get the information right. He nodded, pretending to be impressed. "Oh, yeah. I forgot." Erin gave him a look that told him exactly what she thought of his faulty memory. The obnoxious crack was hardly surprising though. Average-looking men like Dan always hated Adam Hawthorne because he was so incredibly gorgeous. With his ice-blue eyes and that square chin, those broad shoulders and perfectly sculpted abs (not to mention the rest of him), Adam could have been a movie star. She supposed Dan could have been a movie star, too, a sidekick kind of movie star - the average-looking guy with the slightly crooked nose who did dumb stuff and said funny things and was always there for the hero, but never cool enough to be the hero. 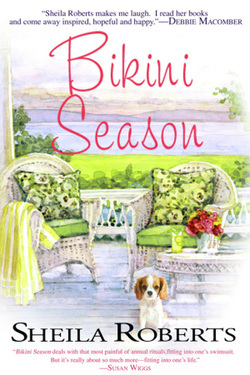 Bikini Season is available online and in local bookstores.